The main focus of our research is to understand how posttranslational modifications—particularly phosphorylation, sumoylation and ubiquitination—of cancer-related factors, regulate cellular process in cancer biology and treatment. Through our research we hope to provide a novel angle of understanding why chemotherapy often fails. Our goal is to identify novel molecular targets or events that have potential to guide the clinical development of new means to inhibit tumor progression and chemoresistance. One of our research aims is to investigate how HDAC2 (Histone deacetylase 2) promotes tumorigenesis through enhancing substrate sumoylation. 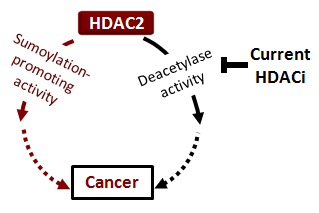 HDAC2 is a key regulator of oncogenic processes and is elevated in several human cancers, but how HDAC2 functions to promote carcinogenesis remains elusive. A commonly known feature of HDAC is to remove the acetyl group from an acetylated lysine and, consequently, our view of HDAC has for many years been solely from the deacetylase perspective. Intriguingly, we have found that HDAC2 possesses a deacetylase-independent sumoylation-promoting activity. To date we have identified two sumoylation substrates of HDAC2, including eukaryotic initiation factor 4E (eIF4E). eIF4E is an mRNA cap-binding factor. As a potent oncogene, eIF4E is found elevated in many human cancer including colorectal cancer (CRC). High levels of eIF4E contribute to carcinogenesis by stimulating protein synthesis of cancer-related genes—genes related to growth, proliferation and apoptosis. We find that sumoylation activates eIF4E-dependent mRNA translation and is required for eIF4E’s anti-apoptotic and oncogenic properties. We further show that HDAC2 promotes sumoylation of eIF4E, resulting in activation of protein translation of a subset eIF4E-target genes. These findings raise the possibility that HDAC2 promotes tumorigenesis through upregulating sumoylation of eIF4E. We are currently validating the functional role of HDAC2 sumoylation activity in intestinal tumorigenesis and dissecting the molecular basis underlying it. We are also interested inuncovering the HDAC mechanism responsible for the limited efficacy of histone deacetylase inhibitor (HDACi) treatment in solid tumors. HDACi is a promising new class of anticancer drugs. Two HDACis—Vorinostat (SAHA) and Romidepsin—are licensed by the United States FDA for the treatment of advanced cutaneous T-cell lymphoma. Despite its low clinical efficacy as a single agent, HDACi shows promise in combination therapy in lung cancer patients suggesting that the full therapeutic potential of HDACis will probably be best realized through a combination with other anticancer agents. Currently there are about 10 ongoing clinical trials testing HDACis for colon cancer (ClinicalTrials.gov); therefore it is critical to identify resistance mechanisms that can lead to strategies that increase HDACi therapeutic potential in CRC. We are investigating HDACi resistance from a previously unexplored angle—HDAC2-mediated sumoylation. We hope the information gained from this study could lead to identification of new drug combinations and more rationally designed future trials. Gao C, G Chen, S-K Kuan, DH Zhang, DD Schlaepfer and J Hu. FAK/PYK2 promotes the Wnt/B-catenin pathway and intestinal tumorigenesis by phosphorlyating G SK3ß. eLife 10.7554/eLife.10072, 2015. Gao C, G Chen, G. Romero, S Moschos, X Xu and J Hu. Induction of Gsk3ß ubiquitination is required for the activation of the Wnt/ß-catenin pathway. J Biol Chem 289:7099-7108, 2014. Xu X, J Vatsyayan, C Gao, CJ Bakkenist and J Hu. HDAC2 promotes eIF4E sumoylation and activates mRNA translation specifically. J Biol Chem285:18139-18143, 2010. Xu X, J Vatsyayan, C Rao, CJ Bakkenist and J Hu. Sumoylation of eIF4E activates mRNA translation. EMBO Reports 11:299-304, 2010. Vatsyayan J, GL Qing, G Xiao and J Hu. SUMO-1 modification of NF-?B2/p100 is essential for stimuli-induced p100 phosphorylation and processing. EMBO Reports 9:885-890, 2008. Hu J, J Straub, D Xiao, SV Singh, HS Yang, N Sonenberg and J Vatsyayan. Phenethyl isothiocyanate, a cancer chemopreventive constituent of cruciferous vegetables, inhibits cap-dependent translation by regulating the level and phosphorylation of 4E-BP1. Cancer Res 67(8):3569-3573, 2007.